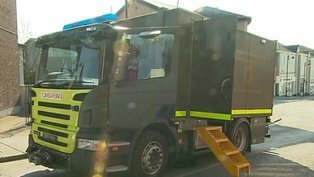 An Army Bomb Disposal Team has made a quantity of unstable chemicals safe in Carlow this morning. The team were called to the Teagasc facility in Oak Park, Carlow town in response to a request from the gardaí at 12.15pm. A quantity of picric acid which was deemed to be in an unstable condition was removed to a safe location. The acid was subsequently disposed in a controlled explosion. The area was declared safe at 2pm. The Defence Forces previously removed and disposed of a quantity of unstable chemicals from the Royal College of Surgeons on 1 October 2010.